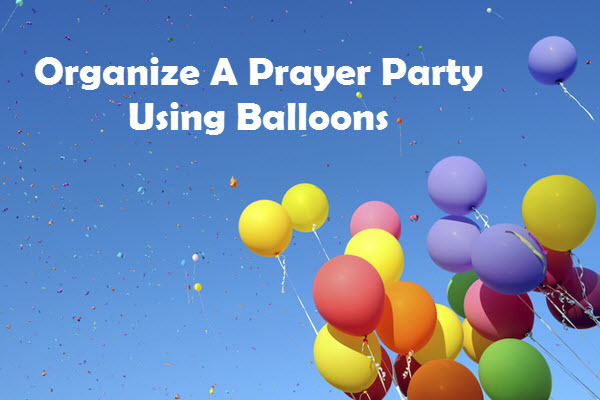 How To Organize A Prayer Party Using Balloons? Have you ever heard of praying for your dear ones with balloons? We often think of sending our prayers to the god so why not use this balloon prayer approach and send your prayers to the god in the most exciting way. Let us try this out. A baby shower is one of the best ways to welcome the newbie that would come and increase the members of your friends and family members in the most cherished way. If you are planning to organize a prayer party for your upcoming baby boy or a girl, we are here with plenty of ideas that would surely give your baby a heart-warming welcome. You may use this idea not only for the baby shower but also for your kids’ birthday where he or she will special and be able to read the prayers of the guests. One of the best ideas that came to my mind is to create beautiful welcome lines on the paper cut in the form of different shapes and sizes. Each shape will have some different and unique slogans that would make your baby day. You can create these cut outs and present them to your guests upon arrival. Make sure, you paste the paper cuts on the balloon and inflate them. Then ask your party guests to hold the balloon and read the slogans that you had written over them. This will spread positive ways in the environment and your baby will feel happy all the way. If weather outside is nice, you can release all the balloons in air and let your prayers (in the form of slogans reach the heavenly bodies without any hassle. No doubt, this is one of the best prayer party idea where your guests will read aloud the prayers and after doing that balloons will be released higher up in the air. For newly wed couples, praying with balloon is one of the trendy ways to pray for their new life. Most of the newly wed couples prayer for their healthy and wealthy life. The best way to send your prayers to the god is to pray for yourself with balloons. Yes, you may find it a bit childish but sometime, it is good to behave childish. When we pray, we often think, how do our prayers go to god? Let us try this technique and send your prayers as high as possible. For this, you can use helium-gas filled balloons and paste your prayer over it. Sit in front of statues of god, and pray for some time. When you think, your prayers are ready to send to god, write them on a piece of a paper and attach that paper to the balloon. Inflate the balloons with helium-gas filled inside it. Let it rise as higher as possible so that your prayers reach the god on time. We know all these are fantasies, but prayer will balloons and sending balloons to the god is one of the best ways to feel contended.